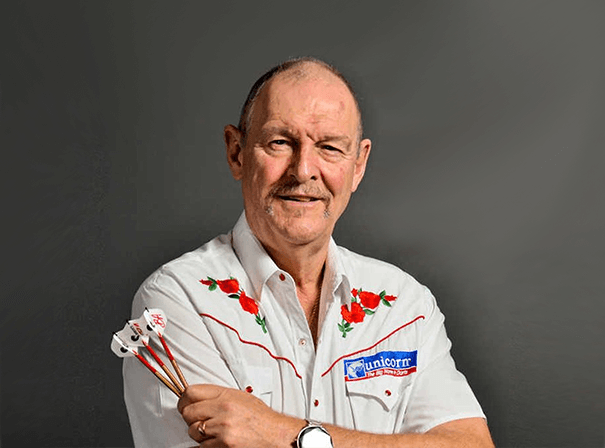 A former professional darts world champion, Bob Anderson was a long standing world number one and is now still very much recognised within the darts community. As such for any sporting event, conference, charity function, awards dinner ambassadorial role, Bob Anderson is a fine choice. For more than three years during the eighties, Bob was ranked as the number one player in the world and was nicknamed The Limestone Cowboy. He started playing the game in 1973 and throws right handed. He walks on the Rhinestone Cowboy by Glen Cambpell and was always a firm favourite with the crowd. It is said that Bob threw the first 180 of his career aged just seven and during his teenage years was a fine athlete including being a would be javelin thrower in the British Olympic team of 1968, 56but an injury put paid to that. He then played football for Lincoln and Guilford City and always played darts in his free time until taking it up as a pro in 1970 after injuries left him out of football. Anderson was amongst the players who formed the Professional Darts Corporation – an organisation (originally known as the WDC – World Darts Council) which separated from the existing governing body, the British Darts Organisation in 1992/93. In 1996 bob won the WDC World Pairs event with the leg-endary Phil The Power Taylor and also set up his own tournament that ran for three years from 2002. As such he is a fine ambassador for the sport and is a great sports personality.